Story: Admiral Yi Sun-shin (Choi Min-sik) has been put in jail and tortured because of wrong accusations by a Japanese spy. When the actual facts are uncovered and the king of Joseon is also in strong need of the extraordinary skills of the admiral against the attacking Japanese he is reinstated in his old position within the marine force. But the Korean marine force was almost completely crushed and Yi Sun-shin has merely twelve ships he can use against the whole Japanese fleet. Moreover, all the torturing took a toll on the admiral's health. Nevertheless, the Japanese marine force, in particular general Wakizaka (Jo Jin-woong), are very careful when it comes to the enemy Yi Sun-shin. Japan has been defeated by him one time too many. This almost paralyzing fear is supposed to be absorbed by pirate captain Kurushima (Ryoo Seung-ryong), who is assigned to Wakizaka. Kurushima has his own agenda, but he doesn't fear Yi Sun-shin. The Korean admiral doesn't stand a chance against Japan's overwhelming fleet and the numerous spies in the Joseon marine force. He doesn't give up, though, and has to prove all of his tactical skills in the oncoming battle of Myeongnyang. Review: "The Admiral: Roaring Currents" has beaten all box office records and is actually the most successful movie in the country. 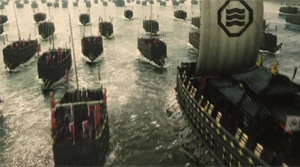 Which shouldn't surprise considering it is a cinematic adaptation of the battle of Myeongnyang, which is counted among the most impressive naval battles in history as admiral Yi defeated an overwhelming number of enemies merely through his choice of the battlefield and by doing so also cutting off the conquering Japanese's supply route on land, forcing them to retreat. Thanks to breathtaking sea battles, which aren't fully generated at the computer, but also feature a lot of physical special effects, the movie leaves no room for a breather from the second half onward. Accordingly, you can easily forgive that a good amount of pathos and hero worshipping simply goes with the territory when it comes to general Yi Sun-shin. There is nearly no one in Korea who hasn't heard from Yi Sun-shin and his achievements. And how could there since his military achievements and the way he defended the coastal areas of Korea are legendary? After all, he also improved the Korean turtle ship to such a degree that the Japanese forces stood nearly no chance against this naval vehicle. Unfortunately, Yi had to go into the battle of Myeongnyang without this extraordinary weapon. However, instead he made the sea's currents his ally in an exceptional manner. It's not just that you will be marveling at the tactical wits of the admiral, the cinematic realization turns out to be extremely thrilling, too. Even if this focus on thrills means that the details around Yi Sun-shin's plans unfortunately take somewhat of a backseat, leaving you wanting for a few more answers. The first half of the film we are introduced to Admiral Yi and we get a small idea of the political and military situation in Korea at that time. Yi has already had a life full of ups and downs and so it's only fitting to introduce him a bit more. However, the same can't be said about some of the supporting characters. They remain somewhat shallow, but at least they have so much personality that you are actually captivated by the events during the more emotional scenes. Yet, it is somewhat of a problem that every soldier looks pretty much the same with all the beards and armors. Furthermore, it's a shame that we don't get to see a bit more of the pirate captain, played by Ryoo Seung-ryong ("The Target", "Masquerade"), and Wakizaka, embodied by Jo Jin-woong ("A Hard Day"). To choose Choi Min-sik ("New World", "I Saw the Devil") as the admiral was surely the best, but also the safest choice. He radiates the necessary screen presence and even during the minor scenes he always displays a certain intensity. But "The Admiral: Roaring Currents" doesn't put that much emphasis on acting achievements, although there are good efforts to be seen all throughout. Instead the sea battles stand in the spotlight. When after an hour everyone finally goes into battle there isn't a single break and the hour before just seemed to serve as a necessary introduction for the unfolding action fest. It's not an exaggeration to say that the battle is one of the most interesting and probably most realistic ones to ever have been put to film. 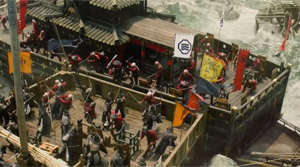 Next to the almost seamless fusing of real special effects and computer generated ones it's particularly the variety in the battles that excites. There is constantly happening something new and the pacing never drops. 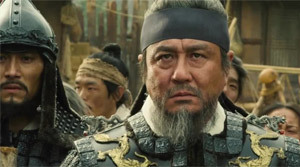 Director Kim Han-min ("War of the Arrows", "Handphone") shows an enormous amount of confidence the way he handles the lavish pictures with ease while also not refraining from constantly showing admiral Yi from the toes upwards with the sun as a backdrop in order to adequately depict the heroic nature of this character. Sadly, there is quite some pathos to be found in other places, too. The almost phony looking dramatic moments can't convince at all times, but all in all Kim manages to make us sit at the edge of our seats in excitement while following the development of the battle. Even people normally disliking sea battles will be able to have fun and despite some pathos and a rather slow first half, which accordingly doesn't really match the latter part of the film, there is a clear thumbs-up for this movie.